The Day of the Dead (Spanish: Día de los Muertos) is a holiday celebrated in many parts of the world, which directs honor and reverence towards one's ancestors. The event is especially popular among Roman Catholics, and mirrors similar days to commemorate the dead in other religious traditions and cultures. Though the subject of death may be considered morbid from the perspective of some, celebrants typically approach the Day of the Dead joyfully. In contrast to Halloween, All Saints Day and All Souls Day, the traditional mood during the Day of the Dead is much brighter with emphasis on honoring the lives of the deceased, and celebrating the continuation of life. The belief is not that death is the end, but rather that death is the beginning of a new stage in life. The holiday has its highest prominence in Mexico, where the celebration has ancient Aztec and Mesoamerican roots. The Day of the Dead is widely observed in other Latin American countries as well including Brazil, where it is followed by visiting cemeteries and churches. The holiday is typically celebrated on November 1 (All Saints' Day) and November 2 (All Souls' Day). 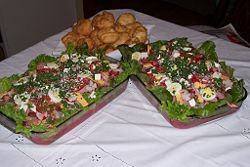 Observance of the holiday has spread to Mexican-American communities in the United States, where in some locations, new elements are being introduced (see below). Similarly-themed celebrations also appear in some Asian and African cultures such as Korea. For thousands of years, various cultures across the globe have placed a very high degree of importance on the veneration of ancestors. Among traditional animistic societies, for example, honoring the deceased has been seen as an essential part of ensuring the well being of society and the family-clan-tribe. It was often believed that the souls of the dead had a profound influence the lives of the living, and veneration of them was seen as necessary for the survival of the community. In several cultures, annual festivals developed to remember and honor the dead, and careful rituals were prescribed to placate-propitiate deceased spirits to keep them benevolent rather than malevolent. In Chinese society, for example, the ancient practice of ancestor worship, still common today, deeply penetrated all aspects of the Chinese ethos. Other societies placed similar significance on communing with the dead, and elaborate rituals developed in African, Carribbean, and Meso-American culture. Over time, specific days for worshiping the dead arose in different parts of the world, which were associated with the regions’ own religious beliefs. Though these culturally distinct "Days of the Dead" were held at different times of the year, their underlying themes were similar-respecting, honoring, and remembering the dead, lead to communal well-being, and both this-worldly and eschatological rewards. In many countries with a Roman Catholic heritage, All Saints Day and All Souls Day have long been holidays where people take the day off work, go to cemeteries with candles and flowers, and give presents to children, usually sweets and toys. In Portugal and Spain, oferendas (offerings) are made on this day. In Spain, the play Don Juan Tenorio is traditionally performed. In Spain, Portugal, Italy and France, people bring flowers to the graves of dead relatives. In Poland, Slovakia, Lithuania, Croatia, Austria and Germany, the tradition is to light candles and visit the graves of deceased relatives. In Tyrol, cakes are left for the dead on the table and the room is kept warm for their comfort. In Brittany, people flock to the cemeteries at nightfall to kneel, bareheaded, at the graves of their loved ones, and to anoint the hollow of the tombstone with holy water or to pour libations of milk on it. At bedtime, the supper is left on the table for the souls. The origins of the Day of the Dead celebrations in Mexico can be traced back to the indigenous peoples such as the Aztec, Maya, P'urhépecha, Nahua, and Totonac. Rituals celebrating the lives of their ancestors have been observed by these civilizations for the last three thousand years. In the pre-Hispanic era, it was common to keep skulls as trophies and display them during the rituals to symbolize death and rebirth. The festival that became the modern Day of the Dead was held in the ninth month of the Aztec calendar, about the beginning of August, and was celebrated for an entire month. The festivities were dedicated to the goddess Mictecacihuatl, known as the "Lady of the Dead," corresponding to the modern Catrina. Some Mexicans feel that death is a solemn occasion, but with elements of celebration because the soul is passing into another life. Plans for the festival are made throughout the year, including gathering the goods to be offered to the dead. During the period of October 31 and November 2, families usually clean and decorate the graves. Most visit the cemeteries where their loved ones are buried and decorate their graves with ofrendas, or offerings, which often include yellow or orange marigold flowers thought to attract souls of the dead. Toys are brought for dead children (los angelitos, or little angels), and bottles of tequila, mezcal, pulque or atole for adults. Families will also offer trinkets and the deceased's favorite candies (dulces) on the grave. Ofrendas (offerings) are also put in homes, usually with foods such as candied pumpkin, pan de muerto ("bread of the dead") or sugar skulls and beverages such as atole. The ofrendas are provided in the homes as a welcoming gesture for the deceased. Some people believe the spirits of the dead eat the "spiritual essence" of the ofrenda food. Additionally, pillows and blankets are left out so that the deceased can rest after their long journey. In some parts of Mexico, such as the towns of Mixquic, Pátzcuaro and Janitzio, people spend all night beside the graves of their relatives. Some families build altars or small shrines in their homes. These altars usually have the Christian cross, statues or pictures of the Blessed Virgin Mary, pictures of deceased relatives and other persons, and scores of candles. Traditionally, families spend time around the altar praying and telling anecdotes about the deceased. In some locations, celebrants wear shells on their clothing so when they dance the dead will wake up because of the noise. Some will dress up as the deceased. Those with writing talent sometimes create short poems, mocking epitaphs of friends, sometimes with things they used to do in life. This custom originated in the eighteenth-nineteenth century, after a newspaper published a poem narrating a dream of a cemetery in the future, "and all of us were dead," proceeding to "read" the tombstones. Theatrical presentations of Don Juan Tenorio by José Zorrilla (1817–1893) are also traditional on this day. A common symbol of the holiday is the skull (colloquially called calavera), which celebrants represent in masks, called calacas (colloquial term for "skeleton"), and foods such as sugar skulls, which are inscribed with the name of the recipient on the forehead. 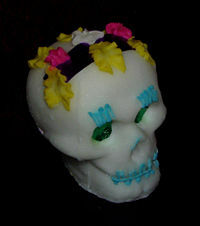 Sugar skulls are gifts that can be given to both the living and the dead. Other holiday foods include pan de muerto, a sweet egg bread made in various shapes, from plain rounds to skulls and rabbits often decorated with white frosting to look like twisted bones. The traditions and activities that take place in celebration of the Day of the Dead are not universal and often vary from town to town. For example, in the town of Pátzcuaro on the Lago de Pátzcuaro in the state of Michoacán, the tradition is very different if the deceased is a child rather than an adult. On November 1 in the year following a child's death, the godparents set a table in the parents' home with sweets, fruits, pan de muerto, a cross, a Rosary and candles. These symbols are meant to celebrate the child’s life. There is also dancing with colorful costumes, often with skull-shaped masks and devil masks in the plaza or garden of the town. At midnight on November 2, the people light candles and ride winged boats called mariposas (Spanish for "butterfly") to Cuiseo, an island in the middle of the lake where there is a cemetery, to honor and celebrate the lives of the dead there. In contrast, the town of Ocotepec, north of Cuernavaca in the state of Morelos opens its doors to visitors in exchange for veladoras (small wax candles) to show respect for the recently dead. In return, the visitors receive tamales and atole. This is only done by the owners of the house where somebody in the household has died in the previous year. Many people of the surrounding areas arrive early to eat for free and enjoy the elaborate altars set up to receive the visitors from "Mictlán." In some parts of the country, children in costumes roam the streets, asking passersby for a calaverita, a small gift of money; in contrast to Halloweeen, they do not knock on people's doors. A Day of the Dead altar in Los Angeles pays homage to dead television shows, with traditional marigolds, sugar skulls and candles. Many U.S. communities with immigrants from Mexico celebrate the Day of the Dead with observances similar to those found in Mexico. In some of these communities, such as in Texas and Arizona,  the celebrations tend to be mostly traditional. In other communities, however, interactions between Mexican traditions and American culture have resulted in expanded events intended to make artistic or sometimes political statements. 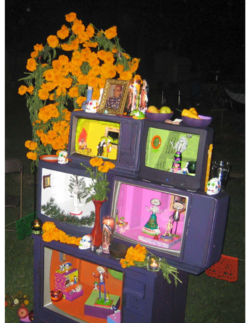 For example, in Los Angeles, California, the Self Help Graphics & Art Mexican-American cultural center presents an annual Day of the Dead celebration, that includes both traditional and political elements, such as altars to honor the victims of the Iraq War highlighting the high casualty rate among Latino soldiers. An innovative version of the Day of the Dead is also evolving at a cemetery near Hollywood. There, in a mixture of Mexican traditions and Hollywood fads, conventional altars are set up side-by-side with altars to Jayne Mansfield and Johnny Ramone. Colorful native dancers and music intermix with performance artists, while sly pranksters play on traditional themes. The Brazilian celebration of "Finados" (Day of the Dead) is held on November 2. On this day, people go to cemeteries and churches, offering flowers, candles, and prayers. The celebration is intended to be positive in order to commemorate those who are deceased. In Haiti, voodoo traditions called Santeria have mixed with Roman Catholicism to create unique observances of this event. For example, loud drums and music are played at all-night celebrations at cemeteries to waken Baron Samedi (spirit of the dead), the god of the dead, and his mischievous family of offspring. In the Philippines, the Day of the Dead is called Araw ng mga Patay, Undas, or Todos Los Santos. It is said to be an opportunity to be with the departed as a type of "family reunion." Since it is intended to be for the purpose of spending time with dead relatives, families usually camp in cemeteries, and sometimes spend a night or two near their relatives' tombs. Card games, eating, drinking, singing and dancing are common activities in the cemetery, probably to alleviate boredom. Additionally, tombs are cleaned or repainted, candles are lit, and flowers are offered. It is considered a very important holiday by many Filipinos (after Christmas and Holy Week), and additional days are normally given as special non-working holidays (but only November 1 is recognized as a legal holiday). The Bon Festival (O-bon (お盆, O-bon) or only Bon (盆, Bon) is a Japanese Buddhist holiday to honor the departed spirits of one's ancestors. This Buddhist festival has evolved into a family reunion holiday during which people from the big cities return to their hometowns and visit and clean their ancestors' graves. Traditionally including a dance festival, this event has existed in Japan for more than five hundred years. In Korea, Chuseok is a major traditional holiday, also called Hankawi (한가위,中秋节). Koreans go where the spirits of one's ancestors are enshrined, and perform rituals of ancestral worship early in the morning. Additionally, they visit the tombs of immediate relatives and ancestors in order to trim the grass and plants and clean the area around the tomb. Traditional foods, drinks, and crops are offered with prayers to their ancestors. The Qingming Festival is a traditional Chinese festival usually occurring around April 5 of the Gregorian calendar. Along with Double Ninth Festival on the ninth day of the ninth month in the Chinese calendar, it is a time to tend to the graves of departed ones. In addition, in the Chinese tradition, the seventh month in the Chinese calendar is called the Ghost Month (鬼月), in which ghosts and spirits come out from the underworld to visit the living. In some African cultures, visits to the graves of ancestors, the leaving of food and gifts, and the asking of protection, are important parts of traditional rituals, especially before the beginning of hunting season. This demonstrates the importance in many traditional African religions of communications with ancestors. ↑ Stefano Rossini.All Saints Day celebrations in Italy Italy Newsletter, online magazine October 29, 2005. Retrieved September 24, 2007. ↑ Carlos Miller The Arizona Republic "Indigenous people wouldn't let 'Day of the Dead' die" Copyright Patrick Murillo History of Day of the Dead Retrieved September 24, 2007. ↑ Ibid., 75-76. Retrieved September 24, 2007. ↑ Danno Wise, Celebration in Port Isabel, TexasGoTexas website. Retrieved September 24, 2007. ↑ Judy HeddingCelebrations in ArizonaRetrieved November 2, 2007. ↑ Saroff photo blogPhotos of Missoula, Montana Day of the Dead parade.Nov. 2, 2006.Retrieved November 2, 2007. ↑ Emily UdellDay of the Dead in PragueRadio Praha online.Retrieved November 2, 2007. ↑ Dawnelle SalantVisit to cemetery in GuatemalaExpat Exchange. Retrieved November 2, 2007. ↑ Igor KopytoffAfrican ancestor ritualRetrieved November 2, 2007. Brandes, Stanley. “The Day of the Dead, Halloween, and the Quest for Mexican National Identity.” Journal of American Folklore 442 (1998): 359-80. __________. “Sugar, Colonialism, and Death: On the Origins of Mexico’s Day of the Dead” Comparative Studies in Sociology and History 39(2) (1997): 270-299. ___________. “Iconogaphy in Mexico’s Day of the Dead.” Ethnohistory 45(2) 1998): 181-218. Garcia-Rivera, Alex. “Death Takes a Holiday.” U.S. Catholic 62 (1997): 50. Roy, Ann. “A Crack Between the Worlds.” Commonwealth 122 (1995): 13-16. History of "Day of the Dead"
This page was last modified on 9 November 2017, at 16:02.